Having left try dry, barren Badlands behind us and driving through the flat, sheer endless plains of Wyoming, I felt myself looking forward to what was to come. Boy was I not disappointed: as soon as we turned into the Teton National Forest, I started feeling like home. Mountains, forests, peaks, snow, cool and humid air, winds and lakes. 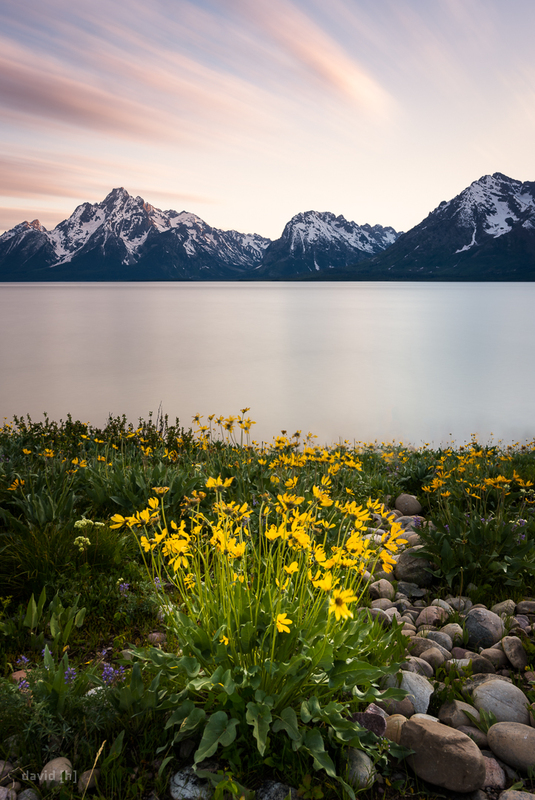 Grand Teton National Park is pretty much the opposite of Badlands and would offer us plenty of vastly different subjects to photograph. We started out with a lucky break – we snagged one of the last 5 camping sites at Coulter Bay Campground – YESS! We’d finally have access to a shower, though not until the following day, as it was way past the official shower hours. Exhausted from the drive and lack of sleep back in Badlands, we decided to take it easy that evening and just enjoy the sunset at the lake, 10 minutes away by foot. As is with photographers, we ended up taking an image each nonetheless. Sunset on our first night at Coulter Bay Campground on Jackson Lake. Waking up well rested, brewing some fresh tea, catching up on the travel journal and just taking the entire atmosphere in was something I had really looked forward to. Energized and freshly showered we started into the day which included mainly planning for the following couple of days, shopping, having Bison burger (holy mother of burger… delicious!) and hopping from WiFi to WiFi. With a plan in writing, we then later headed out to our first stop for sunset: Moulton Barn. This was the first location where we feared our luck had come to an end – a wedding reception was being shot in front of our subject. Soon some more photographers joined our waiting camp and we had a good chat with them. Josh and John tuned out to be some very nice fellows, so we spent the entire evening talking and shooting the barn with them, well into the twilight. We did set off back to camp at some point to catch some sleep though, which we both needed. Sunset over the Moulton Barn. Getting up at 5 am for sunrise was not really worth it – nothing spectacular happened and I was back in bed by 6.15 am, snoozing until 10 am. After some exploring, exiting the park to fly our drones and nearly being consumed by mosquitoes at Two Ocean Lake (screw bears, mosquitoes are the real danger out here! ), we headed over to Signal Mountain, from where we’d be getting amazing views of the entire area around us for golden hour and sunset – sadly without clouds, once again. Getting up there, however, we decided that this wasn’t going to work and headed to camp for an earlier night of sleep. Getting up at 4.15 am the following morning, we headed out to Schwabacher Landing to catch some sunrise glow on the Tetons. Wow, what a scene. There were so many compositions to shoot, we didn’t get around to capturing all of them in the best light, so we decided we’d come back here on the last morning we had in Grand Teton National Park. After a nap, we hiked up to Hidden Falls, west of Jenny Lake, and had a blast shooting the thundering waterfall. A relaxing afternoon, some delicious cantaloupe and a freezing swim in String Lake later, we decided to skip sunset again, as it wasn’t looking too interesting anyways. Mountain glow at Schwabacher Landing on our last morning in Grand Teton. Our second morning at Schwabacher Landing almost fell through, when we arrived and a group of other photographers was warning us to go down to the river because they’d just seen and heard a bear. After some debating and waiting around, we all made our way to the spot together, figuring we’d be safe as a noisy group of photographers. We were not disappointed this morning either, shooting the compositions we missed the day before, chatting to the lovely photographers who were there alongside us and marvelling at beavers, ducks, geese and birds. 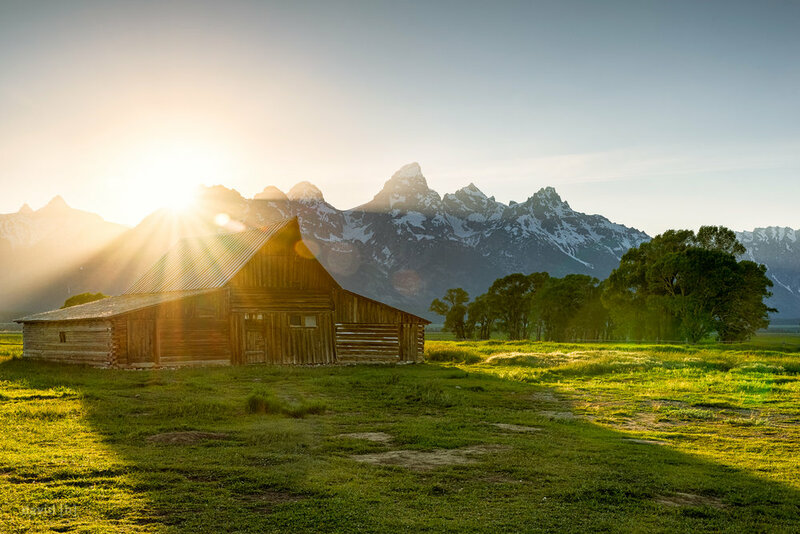 With the last sunrise done we headed back to break camp, have breakfast and make our way up to Yellowstone National Park – to which I am very much looking forward to! Stay tuned for my blog entry from this iconic place.